Sam Davison, a former US Marine, founded the Dacor Corporation in 1954. The name 'Dacor' stems from the first two letters of his last name combined with the first three letters of the word 'Corporation'. The Dacor Corporation changed addresses three different times. Their first location was Evanston, Illinois. Around 1965, they moved to Skokie, Illinois, and in 1970, they went to Northfield, Illinois, where they are still located today. 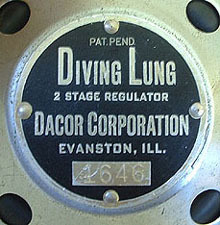 1956 Diving Lung. 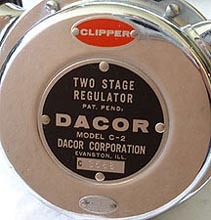 This was the first model of two hose regulator produced by Dacor around 1956. It was unique in that it incorporated two low pressure diaphragms. 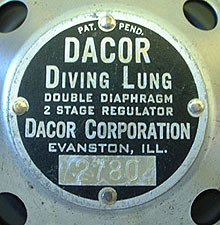 1956-1959 R-2 Diving Lung. This was basically the same regulator as made in earlier years - only the label changed. This model was used for many years. The Dial-A-Breath feature was added in 1959. 1963-1966 C-2 Clipper. Two stage regulator with downstream second stage valve. This model used only one low pressure diaphragm, and also featured the Dial-A-Breath adjustment. 1962-1973 R-4. 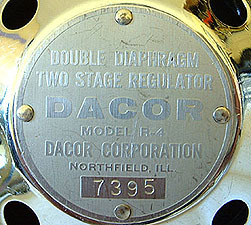 This was Dacor's last double hose regulator, and production ended sometime around 1973. Unfortunately, the label on this particular regulator is missing the black background paint.